This auto manual model is introduced for the first time in India for processing high-frequency welding capabilities. The machine can be operated with foot pedal (Manually) or air press (Automatically) that is it can be used both ways with & without the use of an extra pneumatic machine for higher pressure jobs. 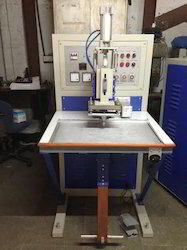 Looking for Auto Manual Plastic Welding Machines ?